Some of you may recognize this dress, published in Threads as an illustration for my article on snoop shopping. What you probably don’t know is that this dress was a joint Sewing Divas effort. I made the pattern, Diva Emeritus Ann sewed it, and Phyllis did the embellishing. All of this was done by phone and e-mail, a great collaborative dress! I started with a sketch based on a top purchased at retail. 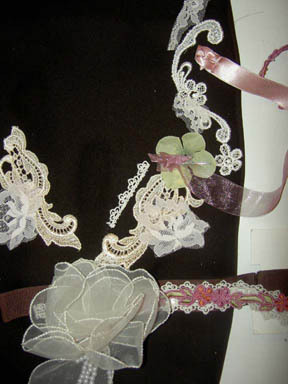 There was to be no embellishing around the neck, just some lace trim and an organza rosette at the center front waist. However, in the way that sketches have of changing as they begin to take shape in RL (Real Life), the original concept had to shift with the requirements of the situation. What happened? First of all, I had to get the sample made FAST – I could not send off to China to get the sample made. 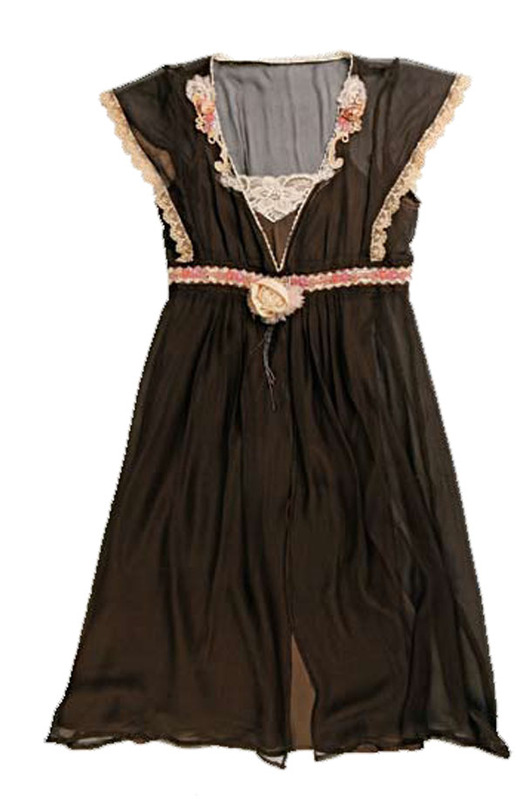 Second, BB (Big Boss) wanted the sample to be in chocolate brown silk chiffon. No chance of dyed to match trim….so I went to the trim stash to see what I could come up with, and purchased a couple of other things to toss in there. I sent all of the disparate elements to Phyllis and she made it into a lyrical cohesive embellishment that added enormously to the final allure of the dress. 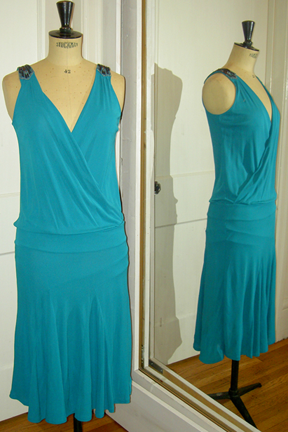 Here’s what I sent her, and just see how she put it together in the final dress above! The tea-dying of all the elements took away some of the white icing on the cupcake look that we struggled with (hence the dress’ nickname). Phyllis’ hand made silk rose at the waistband was the real icing though, with her strands of beads cascading down, far better than the tacky ivory flower pin I sent her, or the organza roses with the trailing ends seen in the photo from the shop in Hong Kong. Phyllis’ embellishment is what made this cupcake dress so yummy! I bought a fantasy yarn in Denmark two years ago and received some fun fantasy ribbon yarns from my friend Annika from the US and they were still waiting to be used. Since the yarns were not enough to knit a shawl they were in my stash because I did not know what to do with it. Some time ago the light bulb went on in my head when I wanted to see a movie on tv but felt the urge to do something with my hands while watching tv.I knitted some necklaces. Easy and fun to do it does not take a long time and the result is a colourful fantasy necklace with little effort to make. The first one I knitted was just a long narrow piece from the fantasy yarn. I used large knitting needles size 9.I knitted a so-called straight stitch on every row till I used all the yarn, joining the short edges was all what I did since the yarn is curly enough so I can wear it just as that. It matches a kiwi green knit short sleeve top. The others I made from a USA Ribbon Yarn called “Incredible. Casting on 8 or 10 stitches wide the first row knit stitches and on the reverse side purl stitches this is called stocking stitches. I did cast off the stitches when the piece was long enough land sewed both short ends together using a large embroidery needle and continue with joining the long edges. For the next 2, I used knit stitches, which is called garter stitches. The pink one I also started with 8 stitches and I Increased some stitches so the rectangle piece begins narrow and widen towards halve of the desired length than do the reverse for the other half decrease the stitches, joining the short and long edges. Enjoy all the novelty yarn that is now available. 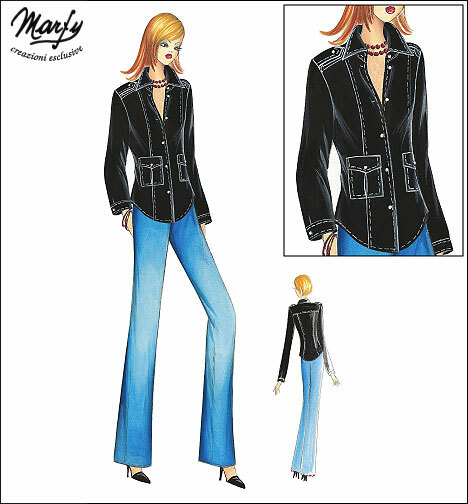 Marfy has also thoughtfully noted fold lines for the pleat on the sleeve and pockets, and these are marked by hand in pencil. The epalet looks at little strange, I might separate that piece. 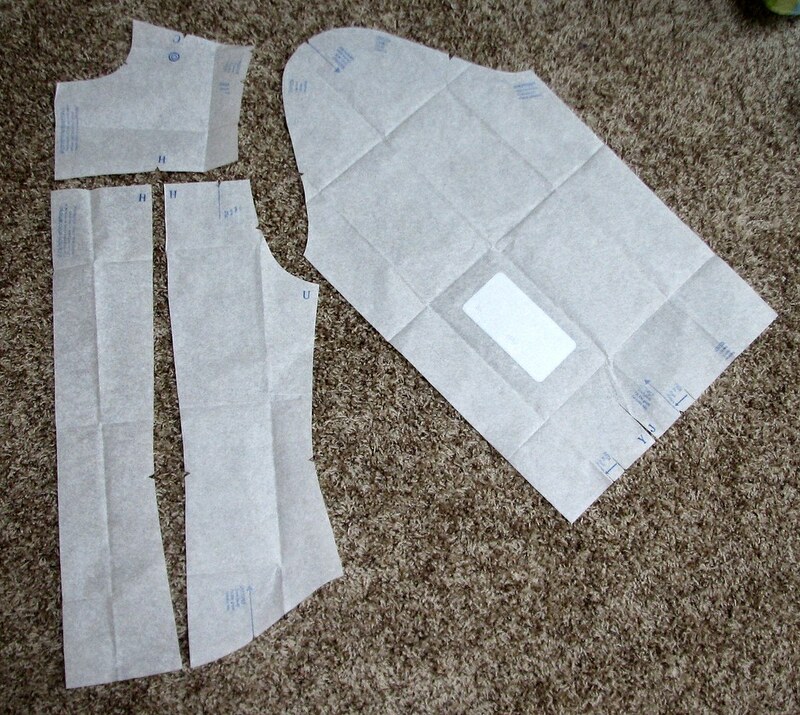 Based on the pattern pieces, I’d say this is an upper intermediate pattern for difficulty (there is a stand collar.) The fabric I’ll be using is this dark brown rayon poly twill from Gorgeous Fabrics, with umber colored topstitching and tortoise buttons. This is a size 46, and I will definitely need to do adjustments, so I think I’ll do a machine thread traced muslin with extra wide seams and then use the altered muslin as the pattern for the fashion fabric. I recently had a few promos from the Big 4 pattern companies in my in-box. You probably got them too, if you have ever clicked on to a pattern company’s website. I love looking at patterns online, whether checking out the current crop of vintage on eBay, or the newest additions at the Big 4 or the Independants. One of the ways pattern companies attempt to differentiate themselves is by the look of the envelope. Fashion drawings, photos, line drawings, stylized drawings, often you can tell at a glance who’s who and what’s what by the look of the envelope. Here’s a quiz: quick, do you know what a Built-By-Wendy envelope drawing looks like? 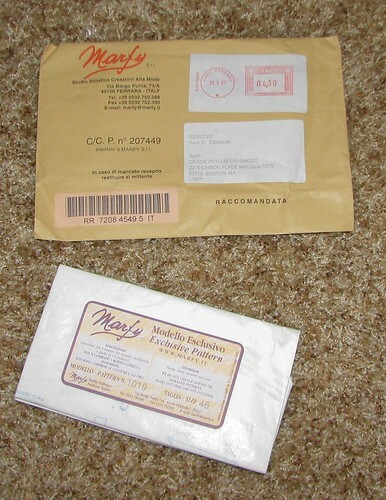 Simplicity, on their website, shows photos, but click on the item and you are taken to view of the envelope. How about Loes Hinse and her ubiquitous model? (Is that her daughter?) What about Folkwear? I bet you can recognize that anywhere. And we have all heard the complaints about KwikSew’s uninspiring drawings. Fortunately for us, most companies include a line drawing somewhere on the envelope to help understand the style. Face it, to make an informed decision about a pattern purchase, we all want the maximum amount of visuals, along with the lowdown on body measurements, fit info, yardage requirements, suggested fabrics. In the day of the $15-20 pattern, a bad pattern choice can be very annoying. The less information available, the less likely I am going to buy that pattern. Contrast my Marfy experience, where I was well informed what to expect before ordering, with recent experiences, well-documented, with HotPatterns. 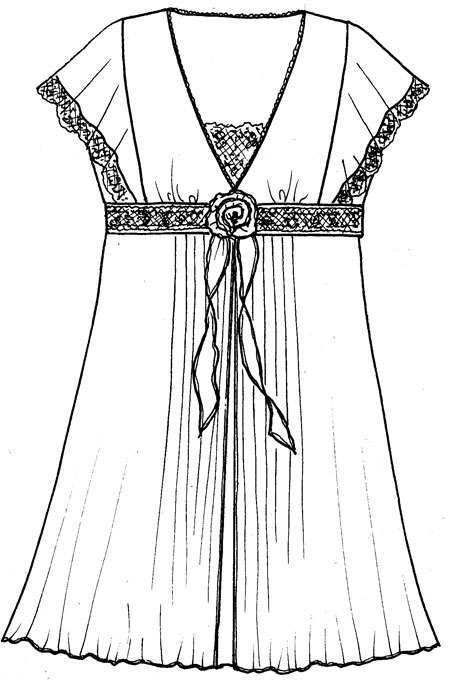 There was a lot of ranting in on-line forums about inadequate sewing instructions, with no pictures, not to mention issues with fitting that most had with the early releases of that pattern line. Mixed in with those complaints were the comments about the disconnect between the drawings and the final sewn product. Somehow, those fashion illustrations, even though accompanied by a technical drawing of sorts, were not enough of an indication of what the envelope contained. It seems though, that sewing enthusiasts are being heard. Kayla Kennington recently updated her website with of garments made with her patterns. There are some beautiful examples of the pattern in different fabrics. I like to think of these as ‘serving suggestions’ – sew it up the same way, or get inspired to make it your own way. Technical drawing? or illustration? photo? or all 3? Which is most important for you in your pattern purchase decision? Shout out to my Dear Daughter for her fashion illustration. (Mostly she is into Japanese manga and anime, but I got her to help out on a project recently.) Thanks to Irena for her Adobe Illustrator line drawing.